Launching this week at the Travel Retail exhibition, Cannes TFWA, The Royal Legacy of 1745 celebrates the centenary of the first commercial bottling of Drambuie in Edinburgh in 1909. 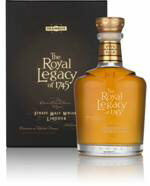 A travel retail exclusive, The Royal Legacy of 1745 is a sublime interpretation of the original royal spirit enjoyed by Bonnie Prince Charlie in 1745. At its heart remains the Prince’s legacy – his secret elixir of exotic herbs and spices sourced from around the globe and unchanged for 260 years. Today of course our master blender has the luxury of hand picking a bespoke selection of Scotland's finest rare aged malts to complement the elixir’s distinctive flavour notes. Drambuie’s art of spirit infusion, perfected over the past century, is taken to new heights with The Royal Legacy of 1745. Hand crafted cask infusion and small batch production guarantee unique product quality in strictly limited quantities. The finished product is bottled at 46%ABV to enhance the intensity of flavour. Presented in an embossed decanter, crowned with a weighty cork stopper, The Royal Legacy of 1745, evokes the luxury and indulgence of a bygone regal age. Taking its cue from the new distinctive core Drambuie packaging, the sword slashes on the shoulders and the interlocking DDs trademark are central features of the decanter. Each decanter’s presentation box will be individually authenticated with the bottling date, bottle number and signature of the Drambuie Master Blender. Miranda Rennie, Marketing Director for Drambuie Liqueur Co. commented: “The Royal Legacy of 1745 is a unique signature statement of Drambuie’s art, craftsmanship and heritage. The Drambuie Liqueur Co. Ltd is an independent, family owned business that has been producing the world-renowned Drambuie Liqueur since 1909. Drambuie is regarded as one of the Top 5 Liqueurs ever produced (Paul Pacult, Spirit’s Journal, 2008) and remains a Top 50 global spirit in volume (IWSR, 2008). The launch of The Royal Legacy of 1745 is a major step in Drambuie’s marketing strategy for GTR, which is an important part of its overall rejuvenation strategy to reposition the brand to appeal to new and younger consumers. The Royal Legacy of 1745™ is available exclusively through select international Travel Retail outlets (70cl & 75cl, 46% ABV, TR RSP of £125/€159/$229).